To diagnose a belt squeal, spray water onto the belt; if the noise gets louder, your belt is slipping. If it quiets down, you’ve probably got either a belt alignment or bearing issue. While there’s a lot you can learn by reading automotive repair manuals, little “wrenching hacks” can make fixing cars a million times easier. What are the best tips and tricks you’ve got up your sleeve? 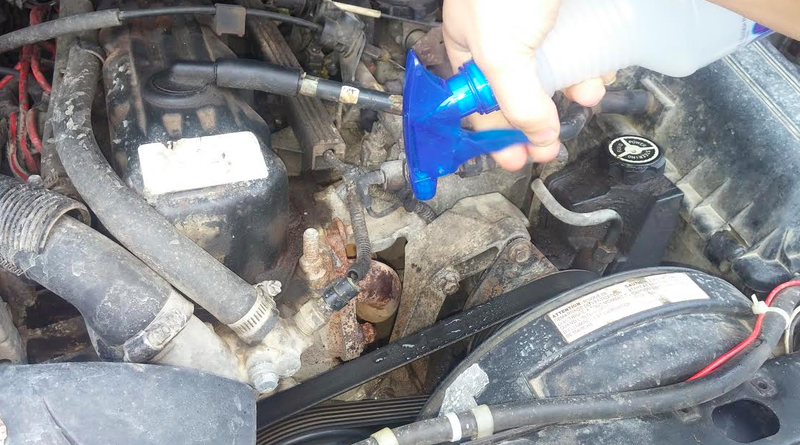 When I first started fixing cars, I found myself frustrated by even little jobs. But as I started accumulating new tricks, things got better, as I was working working smarter, not harder. For example, I know now that if I need to remove a stud, I don’t have to use a set of vice grips and booger up the threads. Instead, I can simply spin two nuts on, tighten them against each other, and loosen the first nut—that should spin the whole stud out. To remove a stud without ruining threads, tighten two nuts against each other and loosen the first one installed. I also learned over the years that if I need to clean oil and grease off my walls and other hard surfaces (because somehow, I manage to get grease everywhere), I use foaming bathroom cleaner. Also, if I need to get sap off my car, I squirt some hand sanitizer on it and wipe it off with a paper towel. And, if my serpentine belt is squealing, I diagnose it with a sprayer bottle as shown in the picture above. If the noise gets louder after spraying the belt, the belt is slipping; if it gets quieter, it’s chirping and there’s likely a pulley alignment or bearing problem. These are only a few of many, many wrenching tips I’ve learned over the years. But there are lots of little hacks out there that maybe I don’t know about yet, so tell us about your most novel ones.